Here is a story of magic, real magic. Sara Crewe is sent home from India to a school in England by her rich father. She has everything that money can buy, so she is nicknamed the 'Little Princess'. But Sara has more than wealth, she has a loving heart, a quick mind, and above all a vivid imagination. 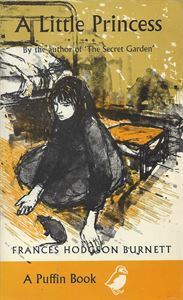 When poverty strikes and she is foreced to live in a garret, go half-staved and ill-clad through the cold London streets doing errands for her cruel headmistress, it is this imagination which helps her survive. Alone in her attic, she makes friends with sparrows and a family of rats, and dreams of her room with all she needs in it.